Williams Sound, global designer and manufacturer of wireless communication technology, has appointed International Sales as its representative for Latin America and Asia. 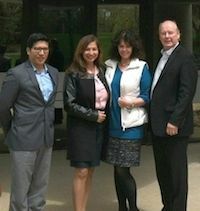 Vice President of International Sales Doreen Ingebrigtsen (second from right) welcomes (l to r) Horacio Morales, Patty Manning and Joe Manning from International Sales to the Williams Sound corporate office in Eden Prairie, Minn.
"We are proud and excited to partner with Joe Manning, Patty Manning, and Horacio Morales to expand our international sales efforts. They are a professional, experienced team with a solid track record of representing manufacturers in Asia and Latin America," said Doreen Ingebrigtsen, vice president of international sales. "As a factory rep firm, Joe, Patty, and Horacio will work closely with our inside sales team to support existing customers and to expand our distribution in the regions of Asia and Latin America," said Ingebrigtsen.